Editor’s Comment: We want to stress that Mike’s spreadsheet is a helpful tool, but it is not a definitive “take-it-to-the-bank” indicator of barrel life. Mike cautions that predicting barrel life involves so many different factors (including how hot the barrel is run), that the task is a bit like predicting tread life on car tires. Still, the spreadsheet is very helpful. It can certainly warn us that some chamberings (such as the 6-284) are likely to be barrel burners. That can help you make a smart decision when choosing a chambering for your next rifle. Share the post "When Will Your Barrel Die? 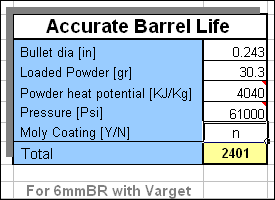 Spreadsheet Predicts Barrel Life"
You cannot base a barrels “great shooting” life by a given or finite number of rounds shot through the barrel. Yes, there is an accuracy degradation curve throughout the barrels life. 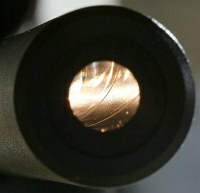 What does impact the number of “accurate” groups/rounds through a barrel life is the type of powder and… very important… how hot of loads are you shooting in the given barrel during its life (not to mention being careful not to wear-out the throat of the barrel while improperly cleaning it with a cleaning rod being pulled up/down or sideways while cleaning! Moreover,good barrels don’t give up shooting well, based upon throat erosion alone. 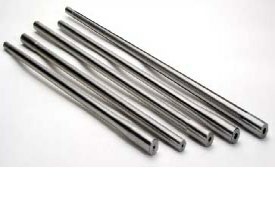 Good barrels can and will last longer as they have very little inherent stress in the steel, making them shoot well longer with high shot-counts, even with substantial throat erosion. While its very important to have a barrel with uniform and square lands throught the length and diameter of the entire barrel,etc, etc, etc…. the lack of hard-spots and stress in the steel is what makes a barrel shoot great, CONSISTENT groups. Unfortuniately there is no known reliable method to identfy stress in the barrel blank steel before its rifled and chambered…. You gotta shoot many groups in them before pronouncing them great fair or bad…..! I think we can learn to measure barrel life characteristics but the amount of data you would need to collect to get very accurate numbers doesn’t make it worth the effort. For example is barrel life affected by the amount of jump the bullet makes to the lands or by having it jammed into the lands or just touching? That would seem like a big factor. So many variables as they stated in the piece to nail it down. Not to mention no two barrels are identical so in the end that data is for a single barrel anyway. I am a silhouette shooter and we have been wondering what kid of round count we can expect from Kreiger barrels in 6.5x47L. we have heard 4000 shots and less. Although we load down compared to BR guys so that should add some life. But to those of us shooting offhand out to 500m is a barrel really shot out just because it opened up .1″ on average after say 2500 shots? Or is it just shot out for the purpose of wringing the most out of the barrel needed for a competition BR rifle? If the numbers about being shot out that I have been reading from BR guys are any indication of wear I think I will get well over 10000 shots before I even notice. if I even do then. As .1″ or even .2″ isn’t something I am likely to notice out to 500 meters offhand. It is axiomatic that “worn out” is a relative term, that is it is relative to the degree of precision required for your application. I have a 204 ruger barrel that is so worn, there is almost no rifling for the first 6 inches of the barrel, but it still produces enough accuracy to shoot gophers within its point blank range. I have a 6.5-284 barrel that was tossed at 700 rounds because I had to chase the lands with VLD bullets and it stopped being F-Class competitive. As to the spreadsheet, the one variable you cannot factor is heat. At least some of the “powder heat potential” values seem questionable. In particular, the one for 50 BMG at 4010. Looking at the IMR burn rate chart (http://www.imrpowder.com/burn-rate.html), 50 BMG is slower than Accurate 8700 (3460) and VV 24N41 (3785). How is that data (powder heat potential) derived? That info would be VERY helpful. Editor: Burn Rate is a different thing than Powder Heat of Explosion/Potential (as stated in KJ/kg). The 4010 KJ/kg Value for 50 BMG is exactly what is listed in QuickLOAD, which I believe is the source for most of these numbers. QuickLOAD lists a Value of 3460 KJ/kg for Accurate No. 8700, which is exactly what is listed in the spreadsheet. QuickLOAD is not always perfect, but QL’s creator normally gets these values directly from the propellant manufacturers. So the spreadsheet appears to be correct, at least to the extent it uses QuickLOAD data. I don’t think we have a better, easily checked set of numbers than QuickLOAD provides. But if you are concerned about a particular value, you can call the manufacturer for an update and input the value given. Give the fact that supplies are scarce and shooting competition has become a thing of the past as a result my .308 will last forever now!!! Another thing to consider and is not mentioned is the types of bullets being shot. A bullet with a longer bearing surface will wear the barrel faster than one with a shorter bearing surface (155gr. bullets vs a 190gr bullets as an example in .30cal.). I can throw even more things to consider. I can verify everything Frank Green said by my hsnds-on experience with 14 & 8 twist 6BR Krieger & Bartlein barrels. 14 twists with 68 gr. Bergers (#24411) are approaching 2000 rounds fired with the slightest trace of the beginning of firecracking, as seen with my borescope. 8 twists that are used only with 105 Bergers (#24428) are developing serious firecracking at around 1500 rounds fired, and I’ve never had one produce acceptable scores ( benchrest score match’s) beyond 2000 rounds fired. Recently i had the barrel off a .223 lrpv and the rifling was barely visible for 2.5 inches beyond the chamber. Working up a load with Varget and watching the groups progress it ended up shooting a three shot 100 yd. group that measured .161 inches c/c. Whatever Savage does to their barrels is working very well indeed, possibly stress relief as mentioned above by Mr. Neary, shore aint a smooth or centered bore !